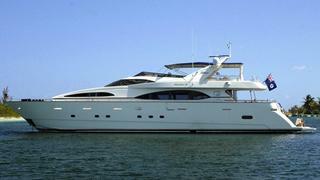 On December 8th 2011 I reported that Yachtzoo in Fort Lauderdale had signed Azimut’s 30.5m motor yacht Natalita III for sale and now news arrives of a $200,000 price cut. Built in 1996 as one of the Azimut Jumbo series, she sleeps eight guests in a master suite, VIP stateroom and two twin cabins while two 1850hp MTU engines give her a cruising speed of 20 knots. On display at the Fort Lauderdale show, Natalita III is down from $1,995,000 to $1,795,000.